"This is an unprecedented response to an unprecedented situation," British Transport Minister Chris Grayling said Monday, describing the measures following the sudden bankruptcy of Monarch Airlines as "the country's biggest ever peacetime repatriation." All Monarch flights to and from the U.K. have been canceled. That leaves roughly 110,000 Monarch customers -- whom the airline was meant to fly back to the U.K. in the next two weeks -- stuck overseas, according to the country's Civil Aviation Authority. The agency said it's organizing replacement flights to bring the travelers home, describing the crisis as "the biggest ever U.K. airline failure." British transportation authorities said they are chartering more than 30 planes for the repatriation flights, creating "a temporary airline from scratch that would be one of the U.K.'s biggest carriers if operating permanently." The collapse also affects 750,000 people booked on future flights or vacations with Monarch, a budget airline that flew to dozens of destinations around Europe and the Mediterranean. The aviation authority has set up a special website to help affected customers at monarch.caa.co.uk. It also told people in the U.K. with plane tickets not to go to the airport, stressing that "there will be no more Monarch flights." The chaotic situation prompted angry and anxious posts on social media. "Thanks @Monarch - that's our Christmas holiday stuffed," tweeted Pauline Bennett, who lives in northwestern England. "Waking up to find out @Monarch has collapsed," tweeted Naveed Khan, a medical student in London. "Flights for a family break are cancelled, and equivalent flights double the price." 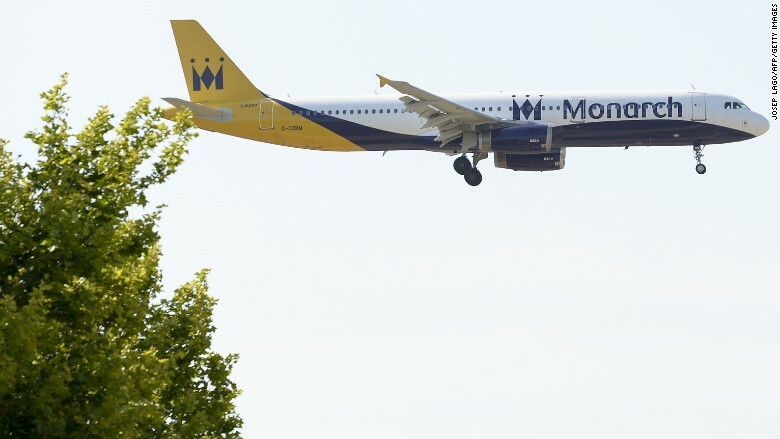 Accounting firm KPMG, which has been appointed to manage Monarch's insolvency, said the airline had been unable to cope with escalating financial problems. Its business had suffered from drops in demand for trips to some destinations like Turkey because of concerns about terrorism. The company also came under pressure from rising costs, intensifying competition and the plunge in the value of the pound against other currencies following Britain's vote to leave the European Union, which reduced Britons' spending power overseas. Monarch Airlines flew to dozens of destinations around Europe and the Mediterranean. As well as the airline, Monarch's tour group business has also gone bust. All future vacations with that business have been canceled. "We understand that this will be a difficult and distressing time for many," said Blair Nimmo, a KPMG partner who's working on the Monarch case. It wasn't immediately clear what would happen to the 2,100 employees at the affected parts of the nearly 50-year-old company. KPMG officials will "be speaking to all of the group's employees today, and commencing the process of returning the group's leased aircraft fleet to its owners," Nimmo said Monday. 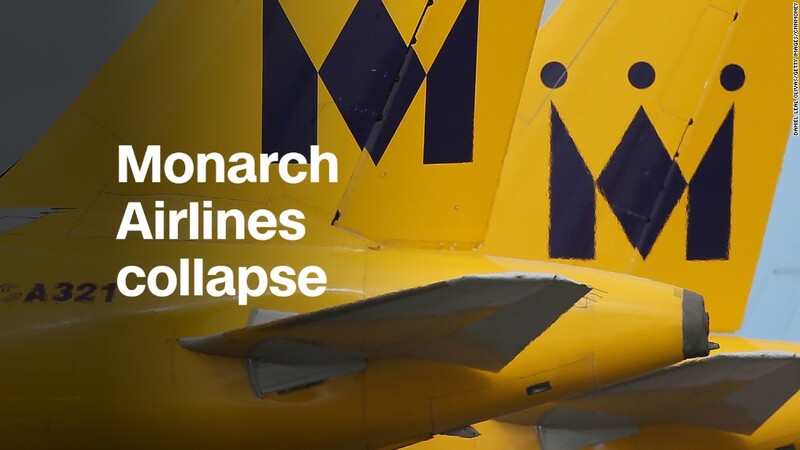 Monarch's owner, investment firm Greybull Capital, apologized for "all the inconvenience and distress" that the company's collapse will cause. Other European carriers have also suffered major difficulties. Air Berlin (AIBEF), Germany's second biggest airline, filed for bankruptcy in August. And Italy has put its struggling national airline, Alitalia, up for sale. Ireland's Ryanair (RYAAY), the biggest airline in Europe, has had to cancel thousands of flights recently because of a shortage of pilots. -- Elaine Ly and Samuel Burke contributed to this report.